My Mother’s Day will not involve breakfast in bed. Instead, I’ll be waking up early and getting 4 kids to church by 7:30 to practice for worship. That’s not a complaint, though…I love that I get to lead worship, and especially that I get to be in the band with my husband! If I were to have breakfast in bed, though, this Coconut Ginger Green Tea Latte would be the perfect drink to accompany it! Maybe I’ll make one “to-go” and bring it to church. In case you’re curious, my sweet family is planning a hike and picnic lunch on Monday to celebrate me for Mother’s Day. I’m so thankful for them, and also for my mom and mother-in-law…and my grandmas and aunts! So much to be thankful for! It’s really important to choose a healthy food plan that you can live with. That means don’t skip the comfort foods, just find a healthier way to serve them! Green tea is admittedly kind of bitter, but I’ve developed a taste for it. It doesn’t totally replace coffee, but helps my cravings a lot and has become one of my comfort foods. 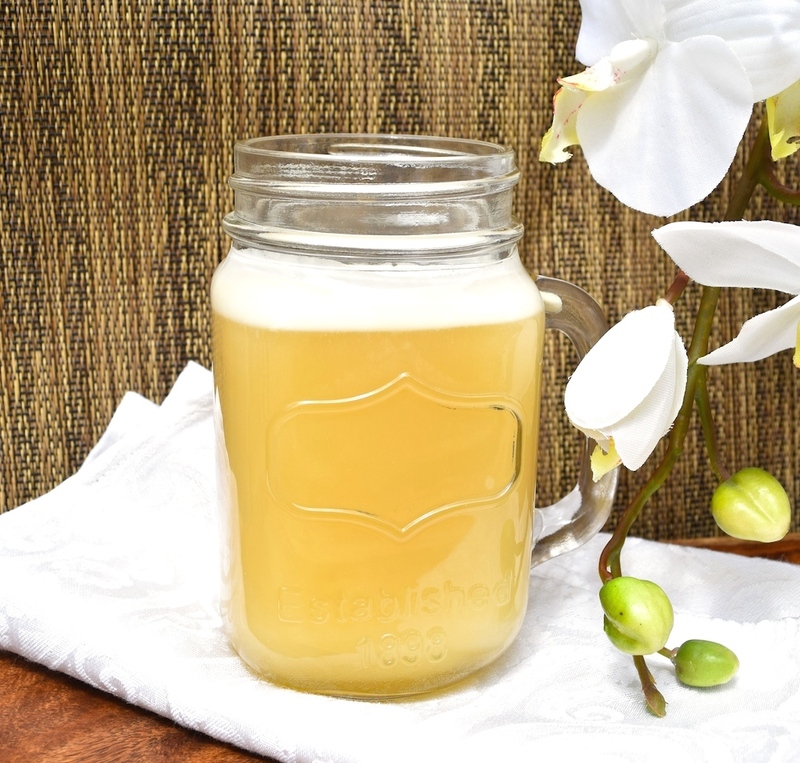 The coconut and ginger flavors in this mixture give it both a smoothness and a zing. Emi and I love it, and she doesn’t normally like green tea much. 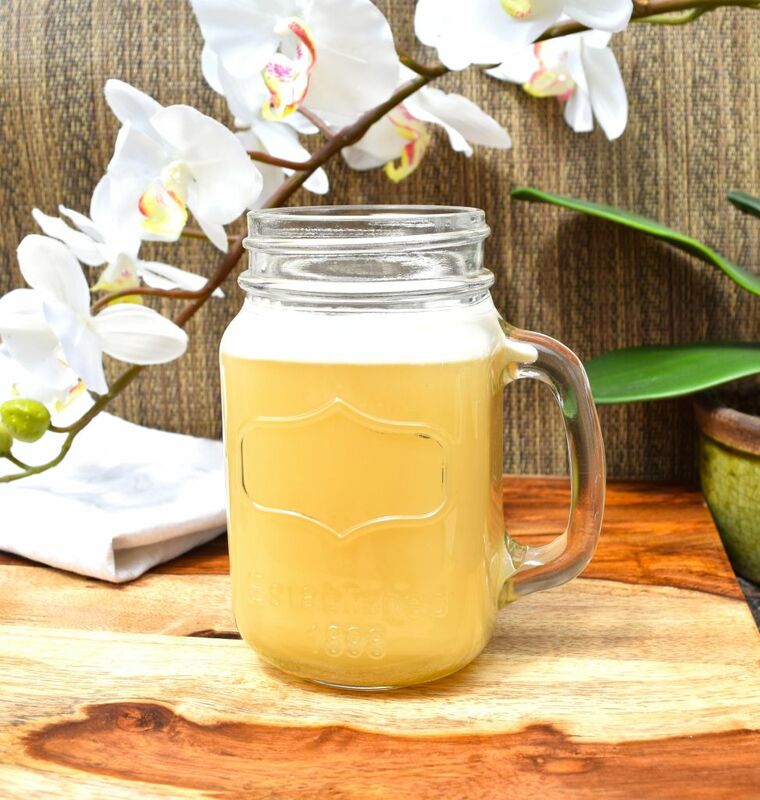 Green tea, coconut, and ginger are all really great for digestion, so this latte isn’t just a tasty addition to your breakfast…it’ll get your metabolism going right for the day. In this recipe you will add a chunk of ginger to the water as you boil it. You can use this technique any time you want to add the flavor and health benefits of ginger to other kinds of teas, as well. I keep ginger in the freezer, then cut off chunks to use as needed. Ginger has a long list of health benefits, and one of my favorites is that it reduces inflammation. 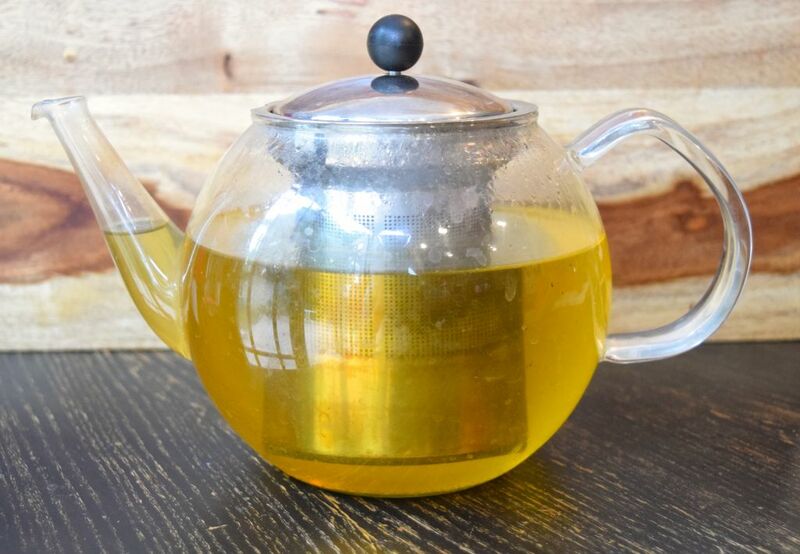 Before we get to the recipe for the Vegan Coconut Ginger Green Tea Latte, I want to invite you to join with others who are making healthy changes. I’d love to walk alongside you in your journey towards wholeness and health! Jesus said, “I have come that they may have life, and have it to the full!” Freedom from food addictions is part of having a truly full life. 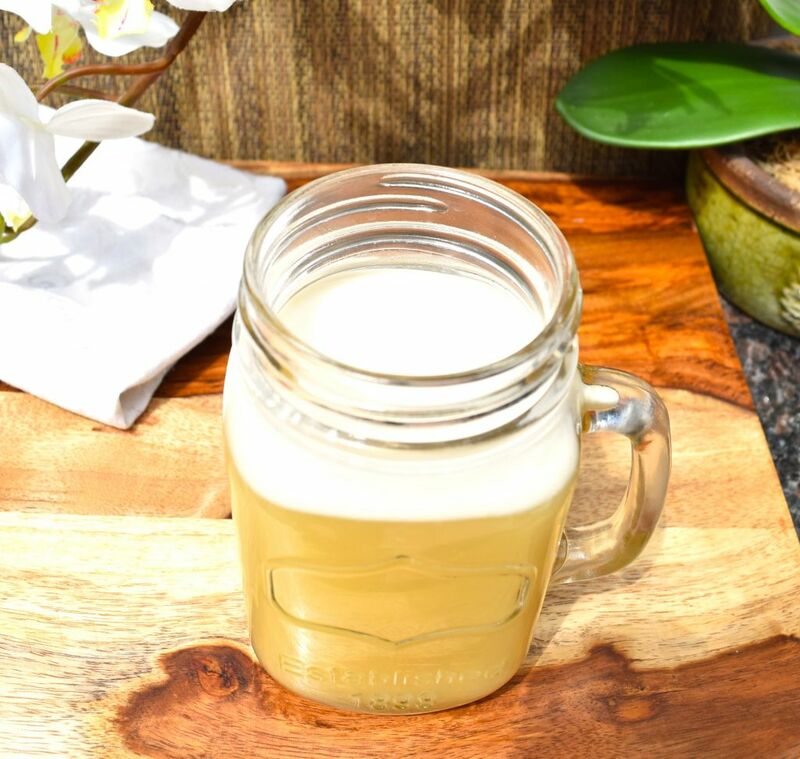 This Vegan Coconut Ginger Green Tea Latte is a great way to start off your day! It'll boost your digestion and reduce inflammation. Healthy comfort food! Boil the water with the chunk of ginger in it, then add the boiling water to a mug with your tea bag in it. Let it brew for 5 minutes, then remove the bag. Add the coconut cream and coconut sugar, and mix well. I got mine to froth at the top by microwaving it for a few seconds. Enjoy! My favorite way to prepare tea is with a loose leaf teapot . If you love tea, I highly recommend buying one! It also works with a French press coffee maker. One Response to "Vegan Coconut Ginger Green Tea Latte"